An overwhelming number of consumers support small and medium-sized businesses in their communities by shopping at them at least once a week, this, according to the recent 2015 Cox Consumer Pulse on Small Businesses Survey. If you’re a small or medium size business owner, this is great news, but there’s even more. Take a look at the full research findings in the infographic below. An overwhelming number of consumers (92 percent) support small and medium-sized businesses in their communities by patronizing these establishments at least once a week, according to the 2015 Cox Consumer Pulse on Small Businesses. In fact, nearly two-thirds, 63 percent, of the survey respondents, visit a small business at least three times a week, according to the survey findings that were released today. Seventy-one percent of the survey respondents attributed their frequent patronage of small businesses to a desire to “buy local.” When looking at other reasons consumers frequent small businesses, convenience, 61 percent, and higher levels of customers service, 54 percent, rounded out the top three. Although the majority of respondents were pleased with their “shopping small” service levels, they ranked a variety of steps small businesses can take to improve the customer experience. Topping this list, 53 percent, is offering more competitive pricing, while many respondents, 46 percent, suggested that small businesses offer loyalty programs. Expanding their hours of operation, 32 percent; broadening their offerings, 24 percent; and offering free Wi-Fi, 20 percent; also would help enhance the customer experience. The study also unveiled a strong desire to prepare and even create the next generation of small business owners by teaching young students the importance of entrepreneurship in the classroom. Nearly 80 percent of respondents think curriculum on entrepreneurship and small business ownership should be covered in K-12 education, with 50 percent responding this curriculum should begin before high school. Steve Rowley serves as Senior Vice President of Cox Business, overseeing its strategic direction, including all marketing, operations, sales, product development and partnership initiatives. Before leading Cox Business he was vice president of sales and field operations for Cox Business’ western U.S. markets where he served as the chief liaison between corporate headquarters and the western markets with oversight on local strategic planning, sales performance, marketing, back office, customer installations and capital investment. 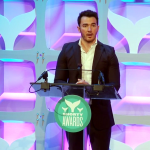 The 7th annual Shorty Awards were held in New York City this past week, honoring outstanding members of the social media community.